Somalia is a country located in eastern part of Africa, and consist of three regions; Somalia, Puntland and Somaliland - each having its separate Government. For many decades Somalia has lacked a well functioning governmental system. The UN backed federal government is currently battling the Islamist militant group al-Shabaab. Al Shabaab continues to put a string of terrorist attacks across the region, making this a dangerous country to visit for foreigners due high threat of kidnap, and terrorism caused by suicide bombers. A federal amateur license issued by the Ministry in Mogadishu is not valid neither in Somaliland nor in Puntland, they all issue their separate licenses. 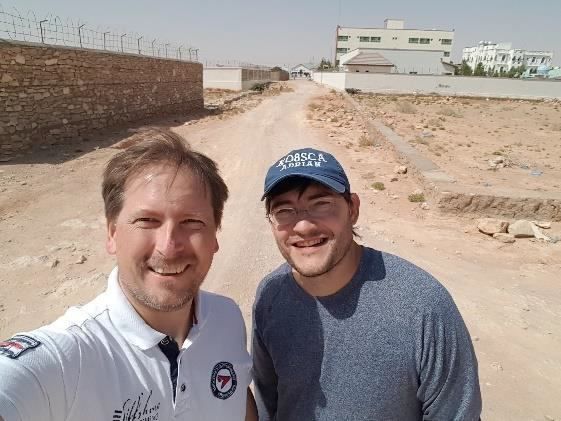 Initially we tried to get a license in Somaliland because Hargeisa, the capital of Somaliland, is considered much safer as well as it has more frequent and secure flight connections. Ken LA7GIA was working on the 6O license. After discussing the license request with the Minister in Somaliland a few times he let us know that no radio license would be issued whatsoever for the time being. They really had no clue about amateur radio, and was very suspiciuos about the «broadcasting» we were going to do. Ken had a hard time to explain the purpose of the amateur radio transmission, and agreed to eventually return later. However, during this process Ken had received an invitation to come to Puntland State of Somalia and make amateur radio transmission. 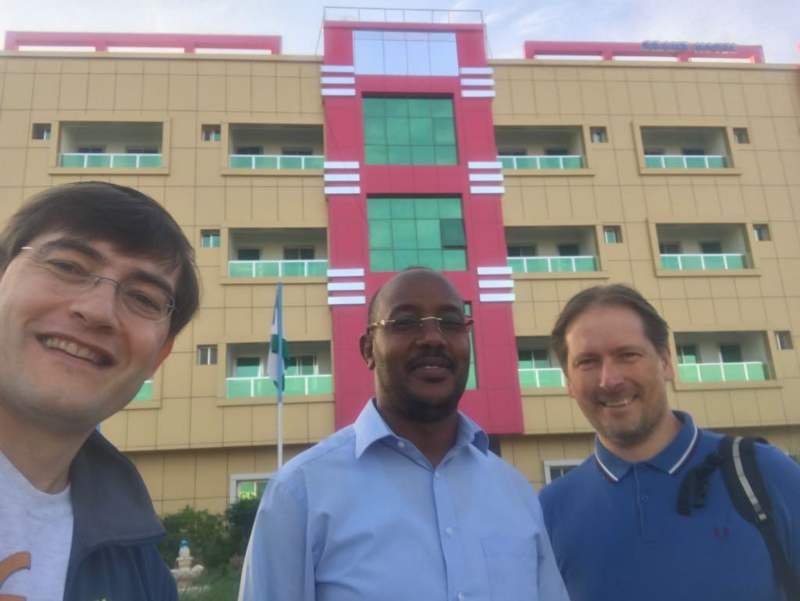 Together with Adrian KO8SCA, we decided to travel to Garowe the administrative capital of Puntland. The Ministry in Puntland really put every effort into making this a successfult trip. Our contact person at the Ministry did more than one could expect. The Ministry sorted out the license as well as the the Puntland VISA - which is issued by invitation only. It’s difficult to get hold of a VISA unless you know someone in Puntland, you need to get an invitation / being sponsored. 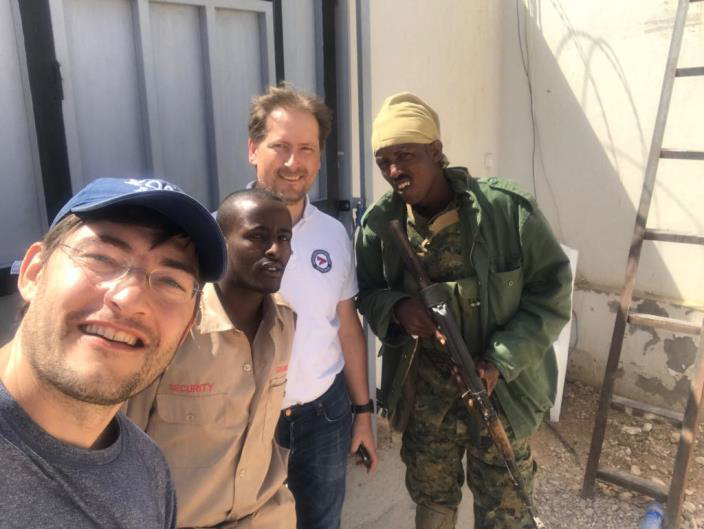 In addition they sorted out our safe and secure hotel accomodation in Garowe, as well as the armed transport from the airport to the hotel. Garowe was chosen as it has been resonable stable the last few years, with few suicide attacks and bomb blasts. Our safety had top priority and there was no question about the armed transport from airport which cost us 800 USD. There were also armed guards at the hotel entrances making this as safe as possible. We teamed up in Dubai Tuesday Jan 2nd 2018. All gear was intact when we the following morning headed to the airport after only 90 min sleep. We checked in all luggage. There was a limit of 30 kg check-in and one hand luggage, but they accepted our 30-50 kg excess luggage each for an expensive cash only fee. 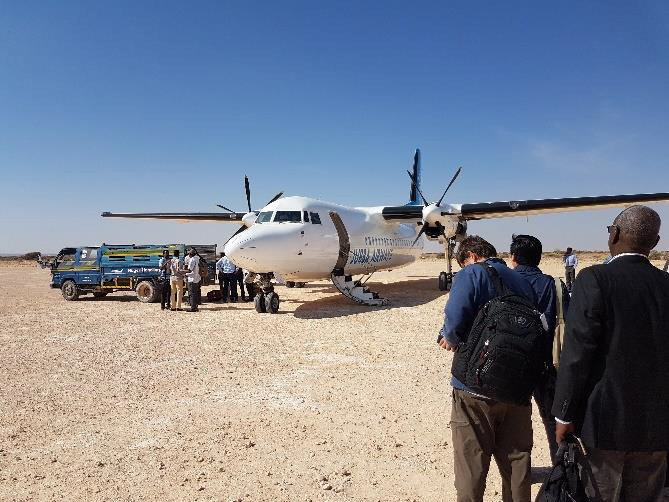 Our flight to Garowe was through Hargeisa where we had to change to a smaller Fokker aircraft. When we arrived in Hargeisa, the flight to Garowe was waiting for us. We had to walk 100m to the aircraft, while at the same time we tried to make sure our luggage was forwarded to the Garowe aircraft, and not left behind. The «check-in» was done at the stairwell! The flight attendant had a piece of paper with all the names, as we were the only two white persons going on that flight we just gave our name and could board the flight with no ID check. It’s the first flight ever that there was no safety demonstration before take-off, it’s the first flight we have been in where they used the seats, the aisle and all available space inside the aircraft to store the luggage. It didn’t feel too safe, but all the other passengers were relaxed - and so were we. Arriving in Garowe, the Ministry met us at the stairwell. We were greeted and guided through customs in a very smooth and efficient way. The Ministry had prepared all customs papers upfront, and we could have our luggage from the aircraft directly at the runway to avoid any queue. We landed at a very bumpy and desert looking temporary airport 40 km outside Garowe. The «customs» where basically an improvised wood shed, a spacious 4x4 meter. Together with the Ministry we were then escorted to the hotel in Garowe by 4 armed guards waiting for us. With all the security in place we truly never felt insecure one moment during our trip. Upon arrving at the hotel, it was soon clear that the hotel manager was very suspicious to our acitivity, even though they upfront had approved our antenna plans. Apparently the hotel Manager had not fully understood our antenna plans, and when he saw his «5 star hotel» - one for each floor - turned into «a communication test facility» (his words) he was not very happy. The Federal President of Somalia was unfortunately coming to visit Garowe for the first time the following week. The Federal President of Somalia was unfortunately coming to visit Garowe for the first time the following week. While the President would be staying across the street, his security staff would be staying in our hotel. The Manager more than once suggested that our antennas were to be used for interception, which the Ministry denied. This high level event delayed our ability to do a proper installation. Garowe city was blocked as they feared suicide bombers would attack the President. We were told by the Ministry to keep a low profile, and pretend we were aid workers if approached by locals. The Ministry had further a hard time to negotiate with the management about our installation. One point in time when they insisted we should await any transmission until the President left 1 week later, we seriously considered to move to another location. 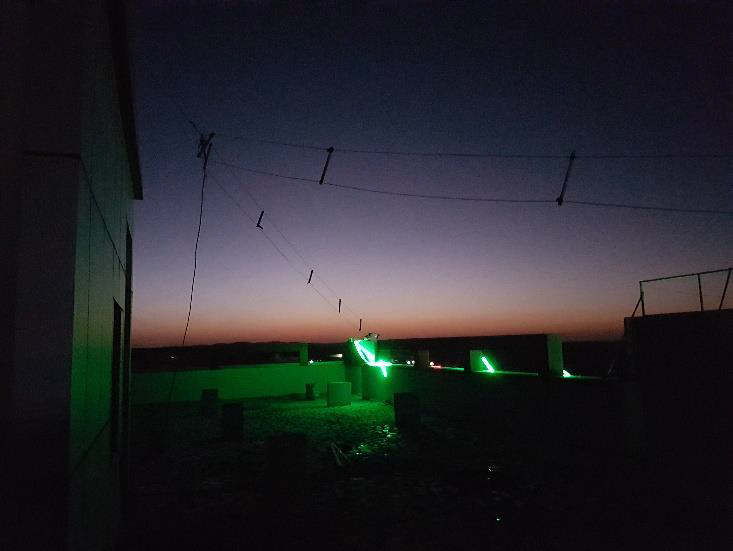 In addition they also wanted all the antennas to be Garowe city invisible to the Presidental staff and not attract unwanted attention. How easy was that? 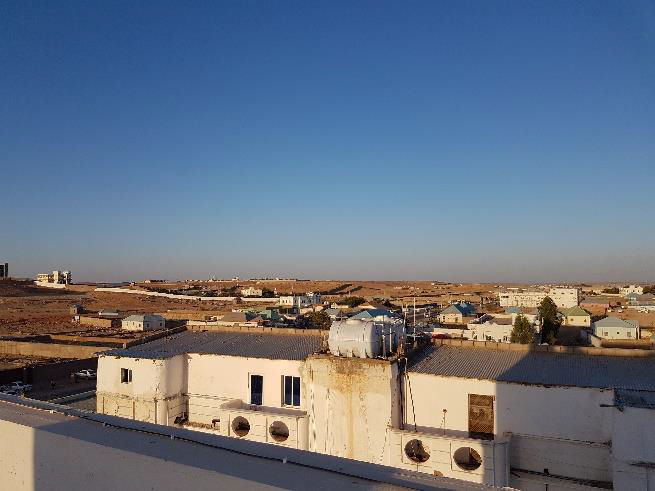 However, the Ministry advised us to stay in this safer area of Garowe, as a move to another hotel would be less secure and expose us to a higher risk we were not willing to take. We preferred to stay in this safer hotel whith armed guards at its entrances. After bypassing the management and talking directly with the hotel owner, we were allowed to complete our installation by third day after arrival before the security staff would arrive. After that, we were not allowed to do any movements involving antenna installation until the presidential event was over. Unfortunately our two main antennas did not arrive with the small aircraft in Garowe because of the size of the bags. Though, the Ministry managed through its contact persons to have the two bags sent by a separate truck all the way in a 12h drive from Somaliland, crossing the border to Garowe the following evening at no cost! We were really impressed, we couldn’t believe it! Until the delayed luggage arrived two days later we had to use our simple backup wire antennas, and limit our operation to 5 out of 9 bands. We managed to setup all TX antennas and one Beverage antenna before the Presidential staff arrived. During the first days we had also been aware of several man made noise sources appearing at our SS at 15 UTC and lasting until abt 20 UTC. These noise source (various lights) impacted all bands in such away that it was impossible to do any decent transmission, even our beverage was picking up too much noise. We identified some of these sources, but were unable to do anything. After the President left, we experimented with all different low band RX antennas we had Beverage on Ground, Beverage and K9AY loop in different locations inside and outside the hotel property. But we had problems installing a proper RX antenna. The ground was very rocky, so attempting to drive the ground rod deeply was not easy. The RX antennas we had outside hotel property was also tampered by locals 4 out of 5 days. Our beverage was located about 60m away from the hotel property and running into an open public area away from the noise sources. This beverage still picked up too much noise after we chocked it. One day the kevlar wire was cut, and two times the locals moved our antenna before they finally stole the wire. We would typically check the beverage just prior to SS to make sure it was intact. But it became clair that even if we had successfully installed a beverage even further away from the hotel, this would soon have been stolen as they were on public ground. really didn’t feel for doing 160m without a proper RX antenna. Instead we focused on 30+40m. 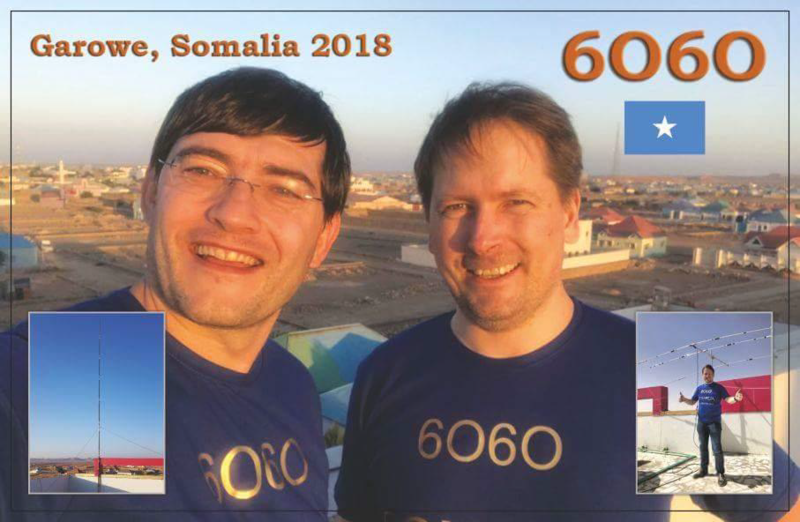 The 500 W amplifier went QRT after 6 days, and this just added to the problems as we were left with one barefoot station, 1 kW station and poor propagation. Due to not being able to operate in prime time to NA between 15-20 UTC because of severe noise, more than 120 operating hours in total, this seriously affected our NA contact rate. During the noisy hours we did some maintenance, improving our RX antennas and rested a little bit. However, we did not sleep for more than 2-3 hours every day. We had a very busy schedule trying to improve the RX setup, as well doing maintenance due to strong wind, negotiating with the management and meeting the Ministry. With so little sleep for such a long period we more than once felt unwell during the operation. Due to all the problems we had, the Ministry decided to stay with us in Garowe to support us, which we were very thankful. The Ministry daily visited us, had a chat, and to see how things were going, and made sure we were safe. They did not know much about amateur radio, but were very interested in our transmission. Without their support, it would be very difficult to do any transmission in Garowe, they solved many problems on our behalf. They also followed us to the stairwell on our day of departure saying goodbye! Fantastic! Propagation wise the predicted openings to NA and Asia did not occur for several bands. Propagation to both US and Asia were harsh. This forced us to run the EU stations while we were supposed to run others. We did have some nice short openings on 12m and 10m, working Asia/VK. As well the 30+40m bands during our nights was usually very good until 3-4 AM. 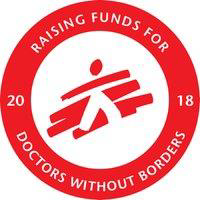 In conjunction with this trip we also organized a humanitarian fundraiser for Doctors without borders. Currently the fundraiser is at about 10.000 USD. All donations from clubs, individuals and OQRS will be earmarked Somalia and Puntland. We have no connection to DWOB – we are not doctors – only engineers and ham radio operators. N5MOA, DJ8NK, JA1BK, K4SV, N7NR, VE3VEE, W2OR, W6SZN, EA3HSO, WX2S AND KQ2I for their fantastic support upfront, and everybody else who supported our fundraiser. We had a very interesting stay in Puntland, and despite all the various problems, this just added to our experience. Your comments were very interesting to me. Unfortunately, not much has changed since I was in Mogadishu in 1961. Good luck and keep a low profile for your safety.